Hello EB community! My entry for the SWEU Contest (Category: Interaction) is the Tsoss Beacon Conference from the novel "Darksaber" by Kevin J Anderson. In 12 ABY, Admiral Natasi Daala called the remaining 13 warlords to Tsoss Beacon in the Deep Core in order reunify the warring Imperial factions. Among those present were self-stylized Superior General Sander Delvardus, High Admiral Treuten Teradoc and Admiral Blitzer Harrsk. 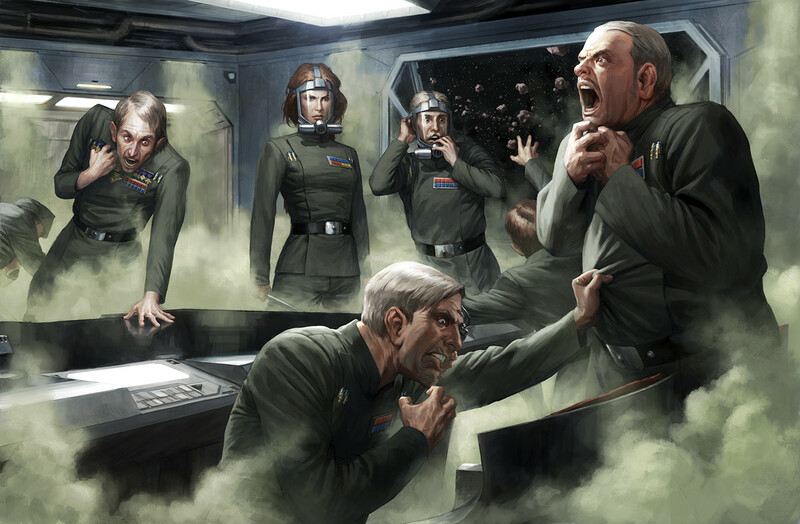 When the warlords refused to cooperate, Daala gassed them and took command of their forces. The Warlords don't match Harrsk, Delvardus and Teradoc because I didn't have better minifig-heads. Also, I placed Daala and Gilad outside the conference room because Lego doesn't make gas masks, I hope that can be seen as artistic freedom. Well, this looks very good too. Also, the quality of the pics is not bad at all. the funny thing is, I haven't read the Callista- and Jedi Academy trilogies. I stumbled across the illustration once and was intrigued, so I looked it up on WP. Opinion on those books seems pretty divided. When I read the summaries, it turned out any relevant events were mentioned in NJO, so I apparently didn't miss anything. Not that bad of photo quality! The small viggnette build is awesome!